This research-based Instructional Design program equips teachers to understand the way the brain learns and to design instruction that intentionally engages the appropriate processes for students to build knowledge and understandings that extend well beyond the classroom. This model is like the engine that drives a car. Understanding and using it can improve teaching in all instructional areas for grades K-12 and beyond. The three-day training, appropriate for schools and school systems, is highly motivational as participants experience the learning they are ultimately equipped to design for their students. 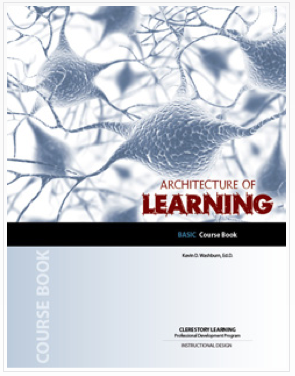 To learn more about the model and the neuroscience and cognitive psychology findings upon which it is based, you may be interested in the book, The Architecture of Learning: Designing Instruction for the Learning Brain by Kevin D. Washburn, Ed.D. CEUs are available from ACSI and may be accepted by other accrediting agencies. Graduate Credit is available through Northwest Missouri State University. All Graduate work is submitted online using the Architecture of Learning Drafting Table. Course Instructor: Kevin D. Washburn, Ed.D.